Create modern graphic shapes of kids, pets and everyday objects to frame or adorn a pillow or plates. Look inside and out for inspiration. Try mushrooms on pillows and bookends with cool cats. 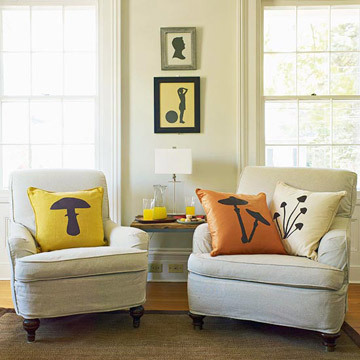 Here's how: Print mushroom silhouettes onto iron-on transfer paper and cut out shapes. Following package instructions, iron silhouettes onto the front of a flat pillowcase. Let cool completely. 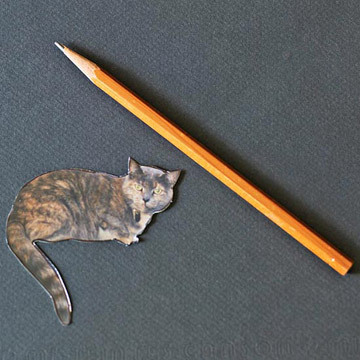 Here's how: To make template, enlarge a cat shape (you can find one online at clipart.com) slightly taller than the height of plain metal bookends. Print and cut out. Using glue stick, adhere desired decorative paper or colored card stock to posterboard. Trace around template on the back side of the paper-covered posterboard and cut out along traced outline, using scissors or an X-Acto knife. 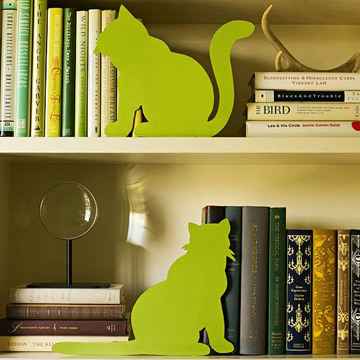 Apply heavy-duty adhesive to the vertical edge of the bookend and attach animal silhouette. Hold for a few minutes until glue sets, then dry thoroughly. Repeat with second bookend. Here's how: Enlarge silverware templates as desired and print onto white card stock; cut out with sharp scissors. Trace around the card stock templates onto the paper-covered side of self-adhesive matte-finish vinyl sheets and cut out. 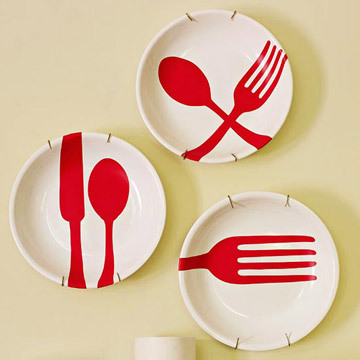 Remove the paper backing and arrange the vinyl cutouts on the plates as desired. Trim rough edges with scissors. Plates are for decorative use only. Designs should be clean and eye-catching. 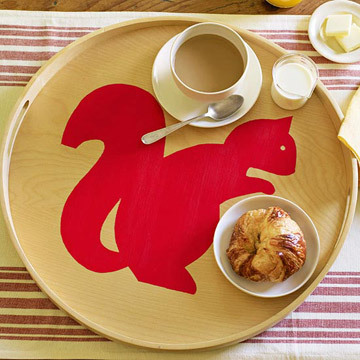 As with this "tray" chic patter, the bolder, the better. Here's how: Enlarge squirrel silhouette to desired size, then print and cut out. Trace around the graphic onto the paper-covered side of Con-Tact paper. Use scissors to cut out the shape. Remove the paper backing and carefully adhere the Con-Tact paper to a wood tray, trimming to fit. Smooth all edges to ensure a tight bond. 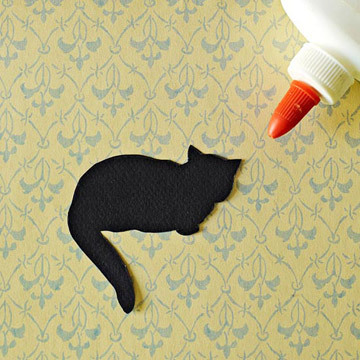 Apply acrylic craft paint to the open cutout area using a foam paint brush. Set aside to dry thoroughly and add a second coat of paint. When fully dry, brush on 2 to 3 coats of polyurethane satin varnish to protect the image. 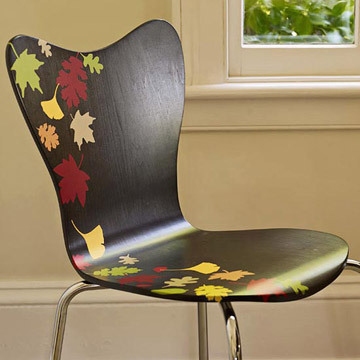 Pep up a plain wood chair with a falling-leaf motif in seasonal shades. 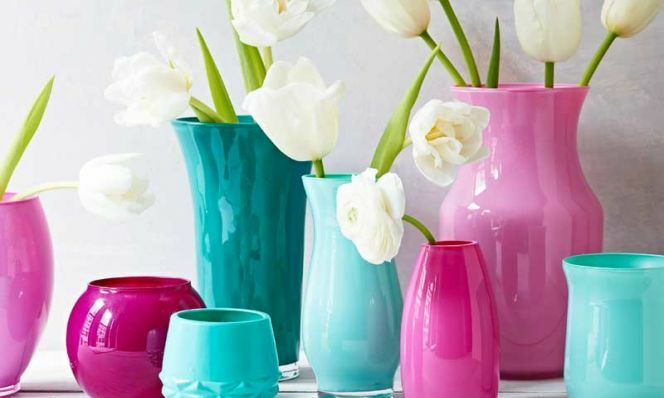 Vana Chupp, lepapierstudio.com and author of Silhouette Art (Chronicle Books), shares her secrets for making modern heirlooms. 1. 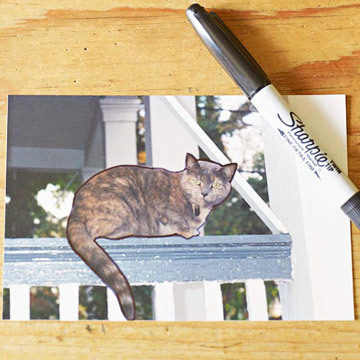 Use a fine-point permanent marker to trace around the desired subject in a favorite photograph or illustration, creating the outline you intend to cut out. "Include any details you would like to see in the finished results," says Chupp. "On profiles of people, for example, you might want to include tufts of hair, eyelashes, the outline of clothing." 2. 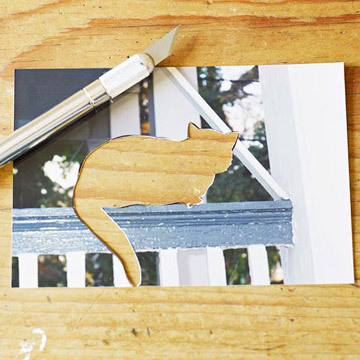 Carefully cut out your pattern with an X-Acto knife or pair of small needlepoint scissors. "It's often easiest to keep your cutting hand steady and move the paper instead," says Chupp. Take extra care when cutting around small shapes—like facial features. These details give the finished silhouette personality. 3. Place silhouette facedown on black construction paper. Trace around its edge with fine marker or pencil. Create varied effects by using colored or patterned papers. If paper is printed on one side only, be sure to place the silhouette facedown on the back side of the pattern. When cut out, the subject will be facing the right way. 4. After carefully cutting out the shape with an X-Acto knife, mount the silhouette on a white background for a classic look, or try contrasting colored paper or wallpaper to create a graphic effect. Evenly cover the back of the silhouette with a thin layer of glue or use a glue stick.